We’d love your help. 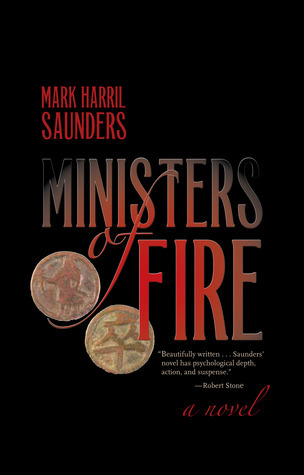 Let us know what’s wrong with this preview of Ministers of Fire by Mark Harril Saunders. Kabul, Afghanistan, 1979: CIA station chief Lucius Burling, an idealistic but flawed product of his nation’s intelligence establishment, barely survives the assassination of the American ambassador. Burling’s reaction to the murder, and his desire to understand its larger meaning, propel him on a journey of intrigue and betrayal that will reach its ultimate end in the streets of Shanghai, months after 9/11. A Chinese dissident physicist may (or may not) be planning to sell his country’s nuclear secrets, and in his story Burling, now living quietly as consul, recognizes the fingerprints of a covert operation, one without the obvious sanction of the Agency. The dissident’s escape draws the violent attention of the Chinese internal security service, and as Burling is drawn inexorably into their path, he must face the ghosts of his past misadventures and a present world of global trafficking, fragile alliances, and the human need for connection above all. To ask other readers questions about Ministers of Fire, please sign up. Ministers of Fire is a literary thriller in the best sense of the term. It’s both exquisitely written, with artful prose and dialogue reminiscent of John Banville or Graham Greene, and has plot twists and a narrative drive that keep you in suspense until the last page. Although political implications (past and present) abound between the US, Afghanistan, and China, perhaps what Saunders does best here is to take the reader into the inner workings of the minds of international spies in a way that is both humanizing and tragic. The somewhat flawed, empathetic characters he develops are memorable from the outset; opening in Afghanistan in 1979, we quickly are faced with a love triangle between April, a bracingly smart “hippie” anthropologist; Burling, an American spy whose love for April is clouding his judgment; and Lindstrom, April’s husband and Burling’s agent who has an axe to grind. The drama plays out both politically and personally on an international stage as the American ambassador (and Burling’s boss) is assassinated, Burling’s family and Lindstrom leave for the US, and Burling takes April with him on an ill-fated mission to meet with Chinese and mujahedin in Samarkand. Saunders’s careful crafting of sentences - “When April was gone, disappeared into the center of the world, her voice inside his head would still insist that he had planned everything—not just the night in Samarkand but all that surrounded it” - attention to descriptive detail, and mastery in capturing the predicament of the human condition results in a truly great read. Full of complex layers of political and personal intrigue. Full disclosure: Mark is my brother, so I may not be the most objective reviewer of this book. However, our shared history allows me to say how well he has captured the peculiar interplay between personal lives and events on the world stage experienced by those in government service and their families. As in the life we experienced growing up, family milestones for the characters in Ministers of Fire are often dated in reference to geopolitical events, and vice versa, and tensions between person Full disclosure: Mark is my brother, so I may not be the most objective reviewer of this book. However, our shared history allows me to say how well he has captured the peculiar interplay between personal lives and events on the world stage experienced by those in government service and their families. As in the life we experienced growing up, family milestones for the characters in Ministers of Fire are often dated in reference to geopolitical events, and vice versa, and tensions between personal and professional priorities can be wrenching. As a literary scholar, I can say that the book is also beautifully written, but never overwritten, with complex, nuanced characters, and a deep moral seriousness that refuses easy answers to complex questions, either personal or geopolitical. At the same time, it’s a very good read, especially hard to put down in the last 100 pages or so, when the plot twists and turns with often-breathtaking speed, sometimes leaving the reader as bewildered as the characters themselves. In the end, much is explained, and some issues resolved, while the reader is left pondering the vast gray areas revealed by a web of conflict dense with competing goals and ideals, none completely pure, but few entirely evil. Ministers of Fire is a great read. It's got the fast-paced plot of a genre thriller, but it's written with the attention to language you expect from literary fiction. A Chinese dissident who holds nuclear secrets that he may or may not be interested in selling needs to be smuggled out of the country, and the Americans are both facilitating his removal and seeking to prevent it. The main actors, meanwhile, are all saddled with baggage dating back to a killing and kidnapping that occurred during t Ministers of Fire is a great read. It's got the fast-paced plot of a genre thriller, but it's written with the attention to language you expect from literary fiction. A Chinese dissident who holds nuclear secrets that he may or may not be interested in selling needs to be smuggled out of the country, and the Americans are both facilitating his removal and seeking to prevent it. The main actors, meanwhile, are all saddled with baggage dating back to a killing and kidnapping that occurred during the Afghans' war against the Soviets. Well written in the format of the old masters: Greene, Ambler, LeCarre &c.' "Ministers of Fire" (Ref: Greene's "Ministry of Fear") has all the convolution and evil intents one could wish, well mixed in fairly modern circumstances. Since many of the players are old warriors with a history with each other it can feel as if Smiley and Karla might appear at any moment. But in this debut novel Saunders has drawn his own characters and created his own maze for them to wander through. How many debut novels garner blurbs from Robert Stone, Joe Kanon, John Casey, and a starred review in Publisher's Weekly? Saunders draws on a wealth of human insight, writerly craft, and informed imagination to deliver a masterfully suspenseful story of international intrigue and its human costs. Don't miss it. Couldn't get through this one. Made it to page 55 and packed it in. Way to many characters introduced up front without any development. Plot was plodding along without direction. I had no engagement with any of the characters and the dialog was pretentious and obtuse. Comparisons to le Carre and Ambler are laughable. A smart and gripping CIA thriller. Absolutely loved it. Never actually knew what was going on in this story. Nice writing style--like John le Carre when he was at his most impenetrable. Never actually knew who were the good guys OR the bad guys. I had to return this to the library midway through. I have to say I seem to have a mental block about remembering who's who with Chinese names. I'd like to give this one a go some other time.